In order to keep my pelvis in the right position, at first I used my glutes, hard. NK wasn't able to see that I was using my glutes to get into the right position, but when I complained my glutes were cramping, she knew, so there ARE two different ways to get your pelvis in the right place - a right one and a wrong one. The wrong one - using your glutes - also prevents my body from moving with Connor and blocks him. In the CrossFit mobility bible "Becoming a Supple Leopard" by Kelly Starrett, he talks about finding the correct neutral position of your pelvis by first squeezing your glutes as hard as you can (which puts the pelvis in the right spot), and then transferring the "hold" to your abs (because those muscles can't put the pelvis in the right place to begin with, but they can keep it there for a lot longer than the glutes can, with less effort), and then to slide your shoulder blades down your back. Sound familiar? I especially tend to use my glutes to keep my pelvis in place in the saddle at the trot and canter. But I'm starting to be able to feel what that does to my ability to follow him (read: totally kills it). Related sidenote: the only movement I've found to isolate the right ab muscle in the gym so far is by doing hanging leg raises. I've never messed with my stirrup length. 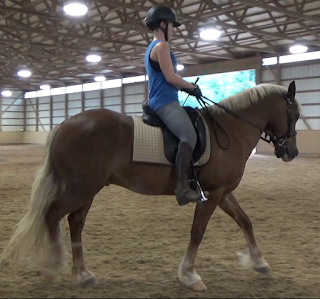 But a couple of weeks ago I was thinking through the fact that it was taking a LOT of active hamstring to maintain the leg position both NK and my regular trainer liked, and I wondered if shortening my stirrups a hole wouldn't put my leg in the same position with less active muscles. It did! So far, so good. It's much easier to keep my leg around him. 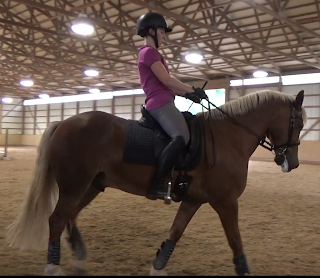 It may not be that I'm not capable of riding with a longer leg, it might be that his conformation and my conformation make it hard to get my leg on the right part of him with a long leg. 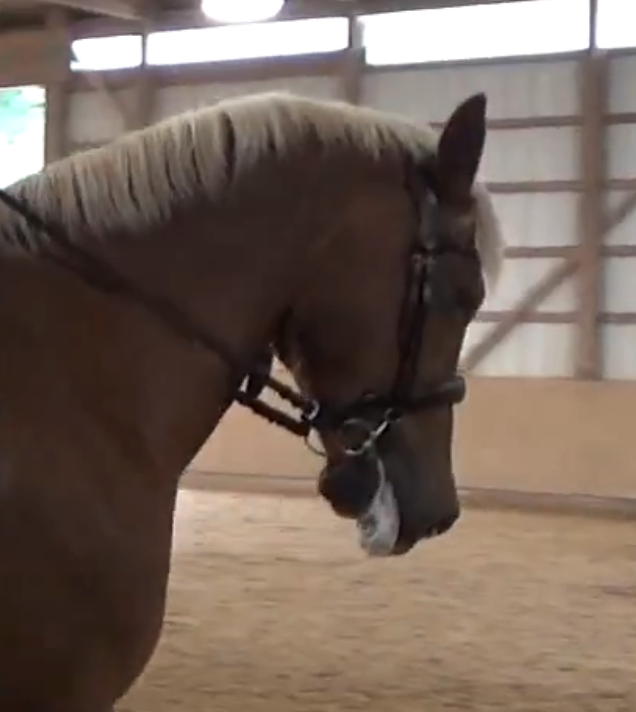 #ponyproblems Pretty easy to see in the photos below. While spending hours painting last weekend, I spent a while thinking about the mechanic of the canter-walk transition. What am I asking him to do? Come up in the front and sit in the back. Where is my upper body usually when I'm asking him to do that? Forward and down. I played with this just a bit last night, and had a lot easier time getting the transition when I kept my torso back (or it felt back to me). Playing with the idea of a "slouchy" lower back and my shoulders being behind my hips here. Also, you can see that this is before I realized my glutes should not be maintaining my pelvis position. That's a really good phrase for that! Thanks for sharing it, I'm going to use it. Oh I LOVE your shorter stirrups! Thanks! Amazing that I never noticed that before. Things just start to feel normal over time that shouldn't be. Yeah, mine too. That exercise from Kelly Starrett is designed to help you feel what a not-tipped-forward pelvis should feel like, if you want to give it a try. WOW big change with the shorter stirrup! Right?! How did I not notice this before? I had a lesson where we started on the ground - literally. I had to kneel on a blanket in the arena and practice posting. I totally discovered that I want to start my post in my right glute, and not post from my thighs. And also that I wanted to tip forward at the top of the post instead of opening my hips. I found this very eye-opening. And agree with the others - love the shorter stirrup on you! That's interesting, I may have to give that a shot! NK has given me some similar feedback on my post in passing before, but we haven't really explored that yet. The new stirrup length made a big difference! Interesting thought about transferring from glutes to abs, I'll have to try that. Yeah! Google Kelly Starrett pelvic reset I think it is. It's super effective and so easy to do yourself. I'm a bit late on this post, but found it super interesting - I'm totally going to try the relaxing the glutes/engaging the abs exercise today. The new stirrup length looks great!